I miss Milly lots. She was my favourite. If that's a suggestion for an epitaph, Sara, it won't take me long to carve... Missed you on the forum lately, where have you been? All well, I hope? Milly Hen one in a Millyon (million)touched so many hearts remembered by them all. Can not wait to see it CC, well done you will be busy chipping away now. Not till the end of July...but I want to get it all planned out so all i need do is set it out on the stone and cut it when i get to summer school. Oh thats a good idea CC do you choose your own stone from the quarry? Cool I got a couple of nice bits of stone not sure what sort it is. I just put little look and tell items on them on the patio along with a few candles. I wouldnt mind having a go at a bit if carving, MY Dad was real good at it but I never ever thought of asking him to show me how to do it, what a shame eh ? There are plenty of have-a-go courses around, NN - you can do odd days at some quarries. I will have to have a look about we got more than enough quarries round here!! That's what I thought...it's worth asking. Sometimes if they have a quiet day they'll give you an informal lesson! Cool it might be a good idea for both G. North and myself to have a go at. I will see what I can find out and then see what he says. I am now offisially ON HOLIDAY and Milly's stone has been designed and the design transferred onto the slate. Work in Progress! Happy holidays CC, well done on making a good start. Seven and a half letters completed today. CAn you take pics please to keep us up to date? Wow CC I didn't realise it had come round so quickly - can't wait to hear and see how it's going! Cor your whizzing along with that CC, I hope you stopped for your lunch break. It now says 'ILLY A SPECIAL HEN'. Last letter tomorrow, then painting the letters and polishing the stone. Its worth going just for the breaks then!!! We are so incredibly excited at seeing the final result, and are planning some kind of ceremony to have for the unveiling! That sounds real nice Neil. Glad you are getting some good grub CC. I had a good healthy salad for my meal tonight then spoilt it by gorging on fresh dug new potato's smothered in loads of butter. Oh my they tasted just soooo good. I made a cheesecake for desert but am to full to have any at the mo !!! Stone is all carved and painted; tomorrow I clean off the excess paint, final polish then pack it up and post it to Hencam HQ! That reminds me...can you whisper the address and your surname please, Neil? Am so looking forward to seeing the stone. It'll be lovely to have a memorial to Milly. Painted, primped, polished, packed and posted! Well done CC you are such a star. I bet it looks lovely and I can not wait to see it. I thought you had gone away on holiday to your stone workers camp. I didn't realise you were still at home. Summer school is only 12 miles away...not worth staying over - and a lot cheaper to stay at home! Just about to whisper my address but guess I'm too late now! Will watch the letterbox with great interest over the next few days! I can,t wait Neil either!!!!!!!! "Hefty postman heaves slab of rock through letterbox in Wilsden." I hope the postman doesn't shove it through the letterbox - it'll break!!!!!!! If he's anything like our postman he'll leave it at the sorting office and just bring an "I tried to deliver but you weren't in ..." card so that you have to troop up there and get it yourself! Can't wait to see a picture of it - hint hint Neil!! Posted By: Kateb Can't wait to see a picture of it - hint hint Neil!! Give us chance, it hasn't arrived yet! Just getting in early!! LOL!! Ha ha it is getting very exciting now. Posted By: Kateb I hope the postman doesn't shove it through the letterbox - it'll break!!!!!!! It was packed in layers of bubblewrap and those inflated bag things that Firebox pack stuff with - thanks, Firebox! Have you got it yet Neil?!!! Yes, he rang me to say it was there safe & sound...don't panic, Mr Mainwaring! oh oh can't wait can't wait !!! Tell me the corner wasn't broken off and it's a fold in the bubble wrap....PLEASE!!! I thought it was meant to be like that? 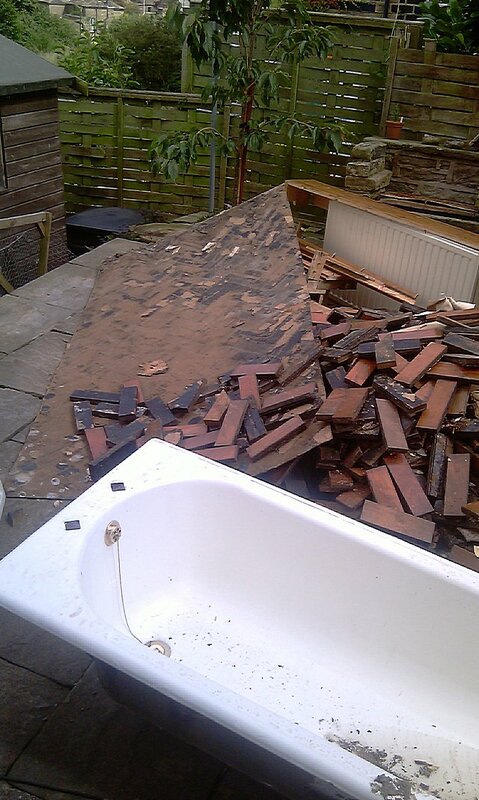 Might not be an unveiling this weekend because we can't actually get to the tree at the moment - there's a huge pile of wood and debris from the downstairs bathroom (plus a skip full outside the house). Hahahahahahaha It actually does look like a bomb's hit! I will post more pics but I amazingly (and stupidly) forgot to take a set of 'before' pics, so will have to dig through family albums to try find some pics of how it was! You would not believe the dust it's all created - the bottom 2 floors of the house are *covered* in dust - that includes the hencam PC (crossed fingers that doesn't make it go into melt-down), and my beloved PS3! What are you having done?!! It looks horrendous - I don't envy you. I really wish we could escape from the dust, rubble and rubbish weather TM! Have you put the stone in situ yet, Neil? Or are you waiting for Red to stop her globetrotting? Oooh a swimming pool for the chickens! Keep the bath and get some ducks. Ohh cool good idea Shobhna we could have hen and duck cam then !!! Yeah!!! That's a great idea! My colleague's dad has just hatched 4 runner ducks for his friend. Sadly, when one hatched it fell from the nest and a rat nibbled at its beak and took some of the front off it, but her dad found it and put it back and it seems to be coping. Get some runners Neil!!! !